The FW-190 D9 is viewed by many as a "good mix of menace and grace". Without question, this aircraft has become one of Meister’s most popular offerings. As this was Ron Petersons first attempt at a warbird of this magnitude, the incredible results he achieved serve as a testament to the well thought, well engineered features designed into this model. 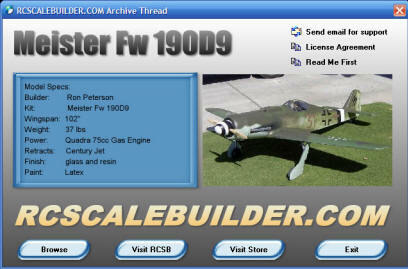 Meister models are designed to be easy to build, and to build fast! If you are considering building one of these as the newest addition to your stable, this offering will serve as an excellent "build manual" that will help ensure your successful completion. If you are considering building this model you can review the construction sequences through the many, many high quality photographs documenting this beautiful model.